Stocking up on school supplies is a favorite pastime of mine. It’s nice that I have kids to buy school supplies for, but even before I did I loved roaming the back to school section in late summer and ogling over sharp pencils, pretty notebooks and colorful pens. I am sharing my love of school supplies with you today featuring a hefty dose of llama style. My kids think llamas are super cool right now and I am loving all the fun styles out there. 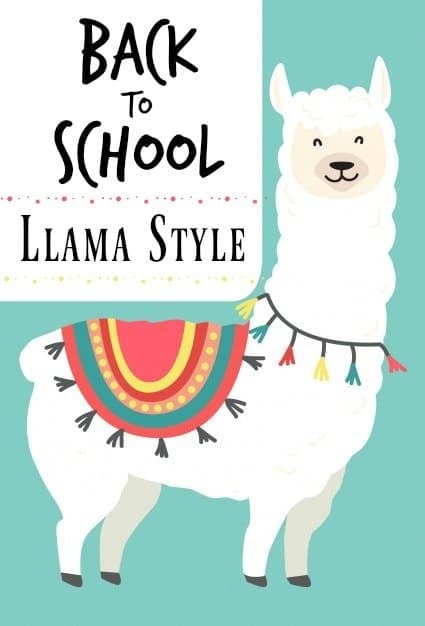 Check out my 14 favorite llama school supplies available on Amazon. You can view all my picks at the link above. This list includes staples like a backpack, water bottle and notebooks as well as fun items like locker magnets, pencil toppers and reusable snack bags. These llama stickers are perfect for teachers and kids wanting to spice up their school supplies. This blank journal would make a fun subject notebook or, if you are not in school, a notebook for your personal use. Plan your year with this llama planner. Dress up your desk or office with this llama pencil cup. Carry your books in style with this cute and durable llama backpack. Backpack not your style? Try this llama tote bag. You can’t go wrong with llama pencils and cut llama erasers. These come in a pack of 12, plenty to share with friends. This insulated bottle will keep drinks cold or warm and looks cute too! Llama washi tape to decorate all those plain notebooks and binders. 2 big llama erasers to show your love for these furry animals. Reusable snack bags have replaced plastic zip bags in our home. Keep your snacks secure and live a little greener with a set of reusable snack bags. Decorate your locker with this big llama magnet and his cute glasses. Pack your lunch in style with this no prob llama insulated lunch tote. Listen to your music with the help of these cute and inexpensive headphones. Be sure to pin this and share it with your llama loving friends. Did I miss anything? What would you add to this llama list?